Local knowledge plays an important role in people’s everyday lives and helps to maintain health, wealth and stable communities. Although in the past decades, a preference for transmitting local knowledge orally or through electronic and virtual media has evolved in Thailand – as everywhere else – the preservation of local knowledge in written form is essential in order to transmit it to future generations. Presently, the contents of mostly unique manuscripts are being explored and investigated to preserve and to reconstruct partially forgotten traditional local knowledge, and numerous initiatives aim at making this knowledge available electronically and via the internet by way of digitisation. The diverse and flexible traditional formats for storing and transmitting local knowledge are generally known as “manual” (tamrā), “treatise” (khamphi), or “handbook” (khu mü). All kinds of information, accounts, procedures, methods and rules may be encoded in these three formats, and be stored in the form of palmleaf manuscripts or paper folding books. The three terms were sometimes used interchangeably. Although some scholars would insist on distinguishing between the three formats, in practical usage their semantic ranges overlap. Generally, knowledge encoded in the manuscript format was dignified by the Sanskrit term for science, sastra (sāt in Thai), to the extent that tamrā and sāstra in many instances are used synonymously. In its original meaning, the term sāstra was used for a written codification of rules in order to regulate certain human practices and activities. At the courts of Thai kings, as well as at the courts of regional tributary rulers and allies, great value was placed on the possession of knowledge in the form of sāstra. This knowledge often was related with acquiring and exercising power, with waging war, with managing the ever shifting balances of allies and enemies, and with the art of governing. Brahmans (in Thai phrām) knowledgeable in the sāstra and adept at providing these aids had been retained in the Thai courts at least since the beginning of the Ayutthaya period. Knowledge of magic spells, incantations, and the creation and manipulation of magic diagrams was regarded as secret knowledge and carefully guarded from falling into the hands of enemies. Practitioners – ritual specialists, astrologers, healers, fortune tellers – claimed to know certain methods to make their spells, incantations, forecasts, or prescriptions more effective than those of their rivals. Theravada Buddhist monks sometimes also acquired sāstra, although such knowledge nowadays may be regarded by devout Buddhists as sheer superstition. The possession of sāstra was not the preserve of the elite alone. There was, and is, a popular dimension to this knowledge. Some medical therapies, fortune-telling, magic, ritual practices and even certain aspects of astrology cannot be traced to foreign influences. Manuscripts which encode local knowledge were regarded as sacred materials, and even the possession of a certain manuscript was sometimes thought to provide protection or special powers. For long periods of time they were hidden treasures in Buddhist monastery libraries or in private and family collections in order to protect their contents and secrets. However, more and more manuscripts are being made publicly accessible in libraries, museums or institutions of higher education, or via the internet in digital form. The examples below are the results of digitisation efforts at the Bavarian State Library (Germany), the State Museums of Berlin (Germany), the Princess Maha Chakri Sirindhorn Anthropology Centre (Thailand) and the British Library (UK). 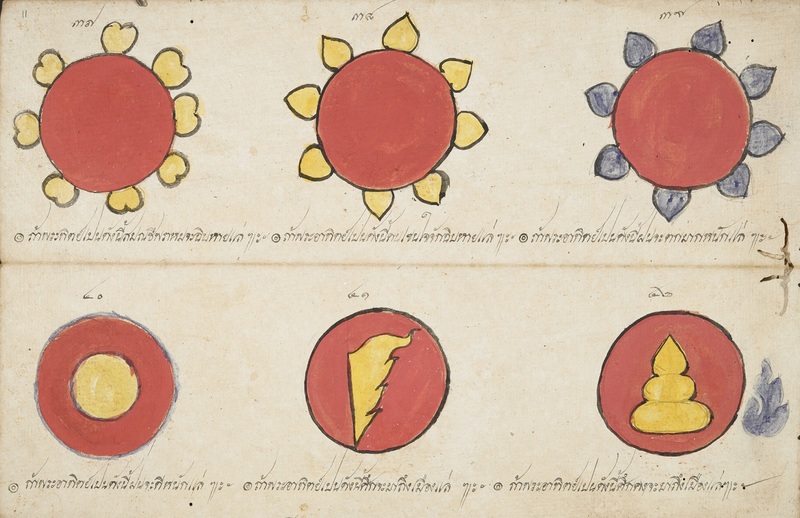 An outstanding example of Thai local knowledge is the Traiphum, a Buddhist cosmology. It is a treatise that describes the Buddhist universe in a Thai traditional understanding. Translated, it would mean “three worlds” (heaven, earth and hell), but in fact it describes many different states of existence, in which concepts of heaven and hell have various levels. Illustrations of the Traiphum depict many facets of the visible and imagined worlds, including many subjects from Buddhist scriptures. 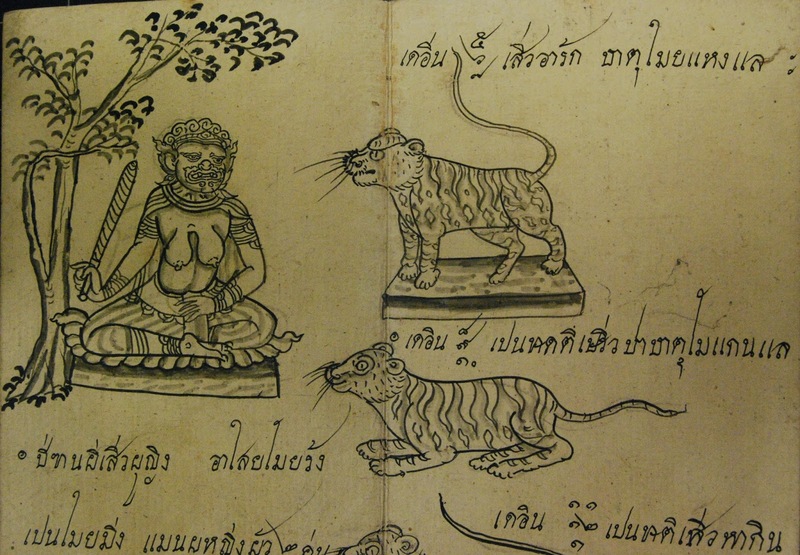 Some Traiphum manuscripts also include fascinating early maps of Thailand and surrounding areas. The map shown above depicts the Indian subcontinent with Sri Lanka, with red lines giving the distances between certain places. 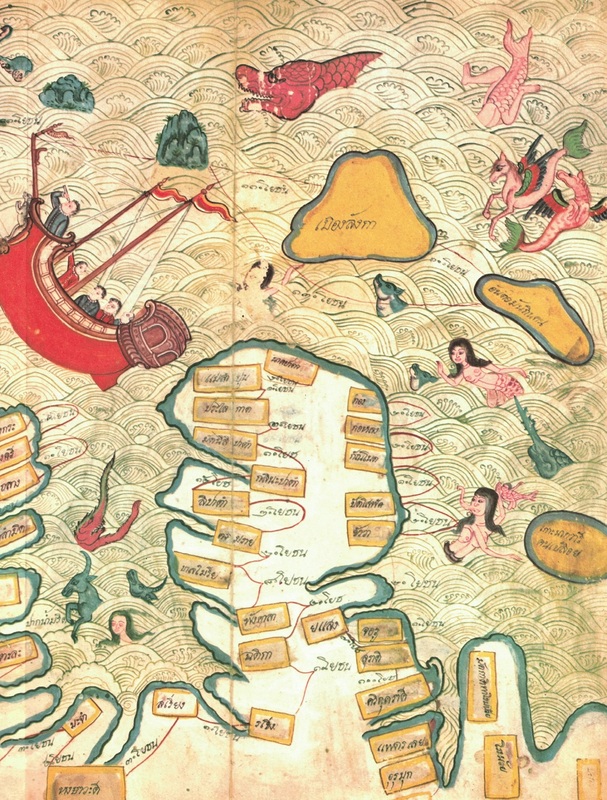 The objective of those maps is not geographic accuracy, but rather to indicate important places and travel routes. Some Traiphum illustrations emphasize the real natural or imagined character of places. Therefore the seas are often filled with all types of creatures; and landscapes are sometimes attributed by mountains, rivers, trees, animals, Buddha footprints or important stupas, which are understood as marking points for geographic orientation. Places like countries, towns and islands are named in some cases. A digital version of parts of the manuscript can be viewed on the website of the State Museums of Berlin. As servants of the king, Thai astrologers possessed knowledge vital to making decisions, for example about when to go to war, when to meet foreign envoys, or when to start the agrarian cycle to achieve the most favourable outcome. In the reign of the late sixteenth-century king, Naresuan, astrologers were asked on numerous occasions to decide most propitious moments to prepare the Siamese army for battle against the Mon ruler at Pegu. They also interpreted the king’s dreams. Astrologers were close to power and because of their expertise provided advice as valuable as that of a minister of state. Thai towns and cities had horoscopes, their respective futures readable in the conjunction of heavenly bodies. Astrology required accurate time-keeping and calendar systems, and for that reason was a science indispensable to maintaining historical records. Nowadays, such manuscripts can be very useful in the determination of approximate or correct dates of historical events. The fully digitised manuscript can be viewed online on the British Library’s Digitised Manuscripts page. Many manuscripts are characterized by drawings of sacred or magic diagrams (yantra) and formulas, which usually could only be produced, read and interpreted by a ritual specialist or a monk who had been trained in this unique knowledge. The historical role of magic and protective diagrams and formula is described in the Thai epic narrative Khun Chang Khun Phaen, for example. It is assumed that magic was mostly used as a protective measure and as a means to improve individual or communal fortune and merit, but it could also serve the aim to disempower real or perceived enemies. The fully digitised manuscript is available online from the website of the Princess Maha Chakri Sirindhorn Anthropology Centre. In its most sophisticated written form Thai medical knowledge was preserved by court physicians who guarded it jealously to keep it from other practitioners. But medical knowledge preserved at the court paralleled and mutually informed a body of local medical knowledge transmitted in the countryside. This medical knowledge should not be regarded as a uniform system of medicine, although the cultural dominance of the court and the practice of writing it down and making it known to Western visitors might lead historians to think otherwise. Regional differences in language, tradition, environment, and differing concepts of well-being meant that there were marked variations in the way illnesses and their treatments were classified in different parts of Thailand. 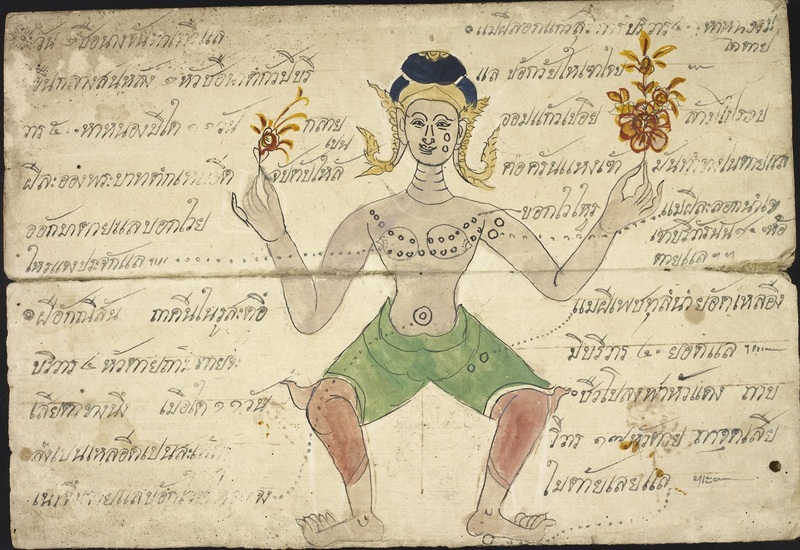 Medical manuscripts often contain illustrations representing the Thai understanding of human anatomy and a wide range of tumours and diseases like the example shown above; others explain methods for childbirth, treatment of different diseases or the use of herbal remedies; and some illustrate methods for massage and acupressure. The manuscript shown above is available online from the British Library. Among Thai animal treatises, those on elephants are the most remarkable. According to traditional belief, elephants – most especially white elephants – symbolised merit, power and wisdom. White elephants had a semi-divine status and were revered as a powerful symbol of the king’s strength and the prosperity of the kingdom. In Thai mythology, certain elephants were thought to have magical powers, like the 33-headed Erawan elephant. A three-headed white elephant served as a royal symbol in several Thai and Lao kingdoms on flags and state emblems. Also, practically, elephants played an important role in warfare. 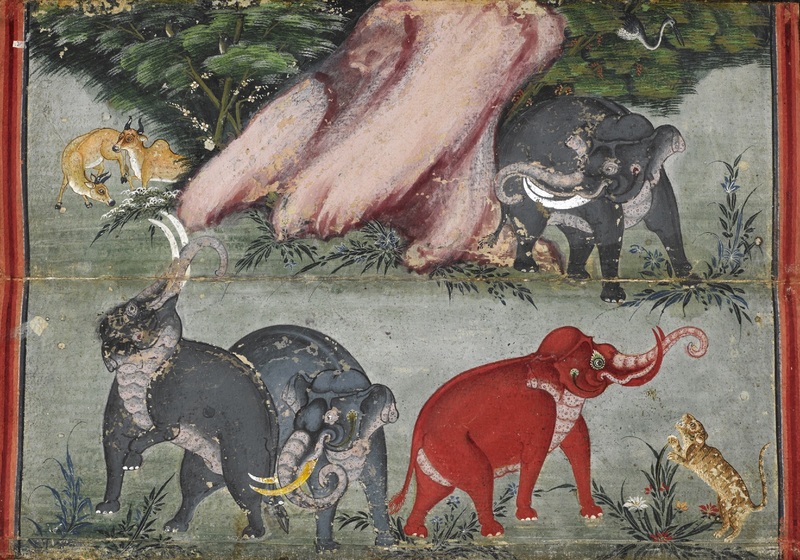 In Thai manuscripts, sacred elephants in the Buddhist context are preferably shown in bright colours (white, light-yellow, golden, light-grey or pink to red), but also real elephants are shown as they appear in nature (grey to dark-grey, some with bright pink patches of skin). Some manuscripts describe real elephants in their natural appearance with advice on their character and whether or not to keep them. Similar manuscripts exist for cats, horses, birds and dogs. The elephant treatise above is available online from the British Library. Thai poetry flourished during the period of King Narai’s reign (1656-1688) as the king was a poet of great merit himself. Poetry and prosody books served as primers and standard textbooks for teaching reading and writing to children and youths well into the Rattanakosin era (19th century). Traditionally, epic narratives and dramas were written in verse form, but poetry also served to praise the Lord Buddha, to honour meritorious people, or to celebrate the beauty of nature and landscapes. Sometimes poems were arranged like a secret code so that only a person who knew the key was able to understand the poem. The manuscript shown above contains a number of beautifully illustrated poems together with poems arranged in diagrams in honour of a beloved lady. The fully digitised manuscript is available online from the Bavarian State Library via the World Digital Library. The Royal Commonwealth Society Library has just created an electronic catalogue for one of its largest and most significant manuscript collections: the papers of the diplomat, colonial administrator and orientalist Henry Burney (1792-1845). Burney was born in Calcutta, the son of a Senior Master of the Calcutta Military School for Orphans. His grandfather was the musicologist Dr Charles Burney and his aunt the novelist Frances Burney. Burney was commissioned into the East India Company’s army in 1808, but transferred to its political service when appointed Military Secretary to the Governor of Penang in 1818. From 1825 he served as Political Agent to the states adjacent to Penang and led several political missions. From the beginning of his career, Burney had displayed a gift for oriental languages, soon mastering Hindustani, and during this time he acquired Siamese and Malay. Burney’s grasp of local politics and languages led to his appointment as Envoy to the Court of Siam, and he travelled to Bangkok in September 1825. By June 1826 he had successfully negotiated a treaty with the King. In 1827 Burney was posted to the new British province of Tenasserim, which had been acquired during the First Anglo-Burmese War (1824-1826), serving as Deputy Commissioner of Tavoy. 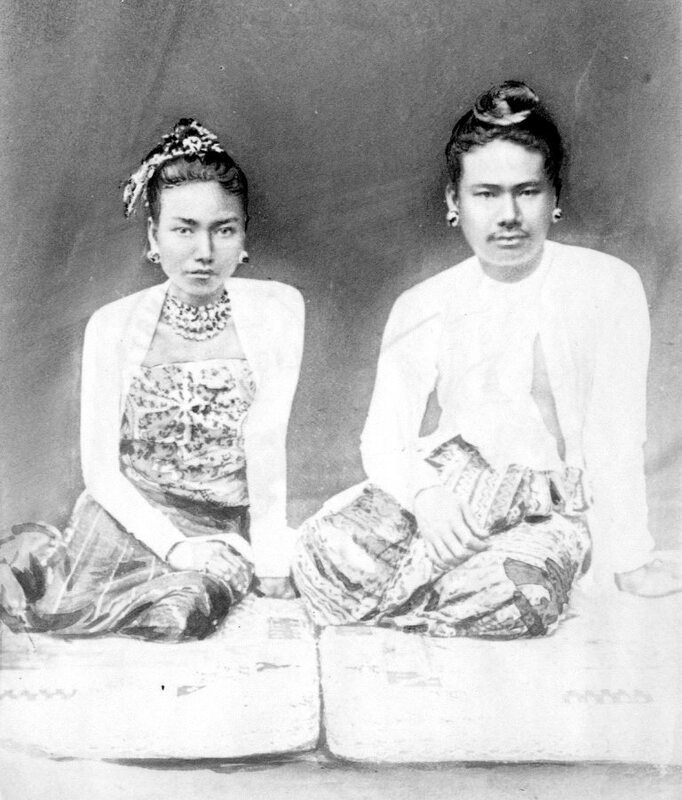 Burney immediately began learning Burmese. In 1829, he acted decisively to suppress a rebellion. His diplomatic experience and linguistic skill were further recognised in 1829 with the appointment as the Indian government’s representative to the Burmese Court. Burney arrived at the capital of Ava on 24 April 1830, establishing the first British Residency. Burney’s study of Burmese (with the aid of a tutor) had advanced so rapidly that by April 1832 he was able to communicate directly with the Burmese ministers in their own language. He enjoyed initial success, resolving the problem of banditry on the Arakan and Tenasserim frontiers and a territorial dispute on the Manipur border. He also persuaded the Burmese government to pay the final instalment of the indemnity owed as part of the war’s settlement. King Bagyidaw appreciated Burney’s efforts to foster good relations, honouring him with a Burmese title inscribed on gold leaf, Mahaz-eyayazanawrahta, accompanied with a badge of office, a nine-stranded salwe. Burney’s position, however, was undermined in 1837 when Bagyidaw was deposed by the Prince of Tharrawaddy, who later became King, and he found it difficult to work with the new regime. Burney was recalled on 8 March 1838 and went on furlough to England. In 1842, he returned to active service with the EIC army, but died at sea in 1845 while travelling to England on medical leave. The collection preserves important records of Burney’s diplomatic missions: his instructions, travel, correspondence, journals and reports, which include rare insight into the Siamese and Burmese Courts. It also contains examples of traditional texts, such as Siamese kradat phlao and Burmese black parabaiks and palm leaf manuscripts. Burney shared the family’s intellectual curiosity and literary flair, and was fascinated by Siamese and Burmese culture. He researched the two countries’ climate, geography, languages, history, philosophy, religion, astronomy, mathematics and astrology, and collected important translations from original sources. Burney presented papers to learned bodies such as the Royal Asiatic Society and published in the ‘Journal of the Asiatic Society of Bengal’, the ‘Asiatic Journal’ and the ‘Journal of the Statistical Society.’ During the early 1840s, Burney received permission from the EIC to publish the journal of his mission to Siam and it is possible that he also contemplated writing a pioneering English language history of Burma. With the resumption of his military career, ill health and an early death at the age of 53, however, these plans never came to fruition. The RCS is also fortunate to possess a number of early photograph collections relating to Burma dating from the 1870s (RCS Y3029A-F), which complement the Burney archive. The Janus catalogue of the Henry Burney Collection, RCMS 65, is now available online via the Janus homepage, a project that provides access to more than 1800 catalogues of archives held throughout Cambridge. The project Lanna Manuscripts – คัมภีร์ล้านนา was launched in 2005 in the premises of the Siam Society in Bangkok. The initial aim was to test the procedures that had been devised for the digitisation of manuscripts. The rich manuscript library of the Society placed under the responsibility of Achan Term Mitem, a well-known specialist from the National Archives of Thailand, provided an ideal venue for such a ‘pilot’ project. Seventeen manuscripts — all tamnan — from the library were digitised, and they were the first documents of this digital collection. Between 2006 and 2011 numerous field-trips took place, scouting Northern Thailand province by province. The Princess Mahachakri Sirindhorn Anthropology Centre in Bangkok, an institute under the supervision of the Thai Ministry of Culture, provided the official backing that enabled project workers to gain access to the collections stored in local repositories. After visiting hundreds of monasteries, forty-one of them were selected either for their rich collections or for their rare manuscripts. In each monastery, the manuscripts deemed worth being integrated into the corpus were studied and photographed in situ. No copies were ever displaced or borrowed. These manuscripts constitute now the main bulk of this online database. Descriptive records containing textual and paratextual information on the manuscripts were first entered in text files, and later integrated into a prototype database. Then, in Paris, the EFEO provided support for transforming the original database into a MySQL Internet database, which took shape in 2013. Then the photographs of all the leaves of each manuscript were edited and inserted into the viewer component of the database. Thumbnail images of the titles were inserted in every record and series of supplementary photographs relating to monasteries, libraries and conservation of the manuscripts, were added in the form of albums. This online collection is aimed at students and researchers interested in philology, literature and history of Thailand, especially texts representative of Northern Thai Buddhism. Over 18,000 pages of manuscripts have been digitised with the focus on a principal genre, the chronicles and traditional stories called tamnan (ตำนาน) which are Buddhist narratives of foundation composed almost entirely in the Northern Thai language and tham (Dhamma) script. For reasons of regional linguistic and cultural unity that kind of text developed throughout the Tai area of Southeast Asia (among the Thai, Lao, Shan and Tai peoples) but especially in the ancient kingdom of Lanna, which covered at least the nine northern provinces of Thailand. 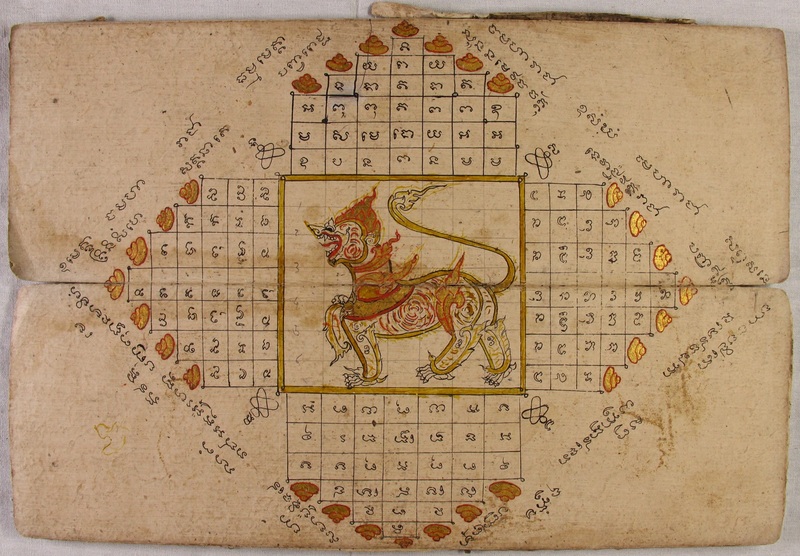 The project website does not only give access to the digitised manuscripts, but also provides rich information on Northern Thai literary traditions, Lanna manuscripts collections elsewhere, bibliographic resources, and photo galleries illustrating various aspects of manuscripts production, storage, preservation etc. The emergence of open gay, lesbian, and transgender (GLT) cultures in major world cities is a sociologically significant phenomenon. The Thai capital Bangkok is home to some of Asia’s oldest and largest GLT communities. Only a decade ago, Asian GLT studies was a neglected if not taboo field. However, the 1st International Conference of Asian Queer Studies in Bangkok in 2005 demonstrated the rapid maturing of this new field. Research libraries though have not kept up with this rapid academic development, and for a variety of reasons have not collected the publications of Thai GLT communities. Since the 1970s, Thailand’s GLT communities have produced large quantities of Thai language publications including multi-issue periodicals and magazines and community organization newsletters. This large volume of vernacular materials, totalling several thousand items, documents the history of one of the world’s most important non-Western homosexual/transgender cultures and is a largely untouched research trove. Thailand’s GLT magazines are an academic resource of genuine international importance. While extensive, like the communities they represent, Thai GLT magazines are socially marginalised and culturally stigmatised. Thai GLT publications have often been ephemeral and of an underground nature known only to the members of these marginalised communities themselves. They have rarely been distributed through mainstream bookstores or magazine outlets. As a result, there is currently no public archive of Thai GLT vernacular materials anywhere in the world, and research in this field is seriously hindered by this institutional deficiency. These materials are in danger of being destroyed and disappearing completely in the next few years. Since no Thai or Western library or archive has collected these materials, the only remaining copies are in the hands of private collectors. This project, funded by the British Library’s Endangered Archives Programme, was part of an attempt by Thai community organisations, working in collaboration with the Australian National University, to preserve materials that have not been collected by any Thai institutional archive. In order to set the groundwork for this project, Thai community organisations were encouraged to physically salvage the materials that were finally digitised. These materials have never previously been collected in one location. This project also operated under the added disadvantage of a local situation where some authorities view the materials as deserving of destruction rather than preservation. A total of 648 issues of Thai gay, lesbian and transgender community organisations and commercial magazines from 32 different series were digitised. A website hosted by the Australian National University has been created and pdf versions of each magazine issue have been posted there. Information on the website is in the process of being translated into Thai, to make this resource fully bilingually functional. The original materials will be transferred to the Princess Maha Chakri Sirindhorn Anthropology Centre (SAC), Bangkok – the final transfer was delayed because of the disruptions caused by the massive flooding of Bangkok in late 2011. In memory of Parathakorn (Joe) Nimsang (Born 12 March 1979, Died 10 April 2014) whose tireless dedication to preserving Thailand’s heritage of endangered gay, lesbian and transgender publications was pivotal to the successs of the Thai Rainbow Archives Project. Originally composed in India in Sanskrit over two and half thousand years ago by Valmiki, the Ramayana is also one of the most popular masterworks throughout Southeast Asia. This is reflected not only in the literary traditions, but also in the performing and fine arts, as well as in architecture and modern design. The epic tells the story of Rama, his brother Lakshmana and Rama’s wife Sita, who was kidnapped by the demon king Ravana. The main part of the epic is about the fight between Ravana and Rama, who wants to get his wife back. In this battle, Rama is supported by his brother and a monkey chief, Hanuman, with his armies. Knowledge of the Ramayana in Southeast Asia can be traced back to the 5th century in stone inscriptions from Funan, the first Hindu kingdom in mainland Southeast Asia. An outstanding series of reliefs of the Battle of Lanka from the 12th century still exists at Angkor Wat in Cambodia, and Ramayana sculptures from the same period can be found at Pagan in Myanmar. Thailand’s old capital Ayutthya founded in 1347 is said to have been modelled on Ayodhya, Rama’s birthplace and setting of the Ramayana. New versions of the epic were written in poetry and prose and as dramas in Burmese, Thai, Khmer, Lao, Malay, Javanese and Balinese, and the story continues to be told in dance-dramas, music, puppet and shadow theatre throughout Southeast Asia. Most of these versions change parts of the story significantly to reflect the different natural environments, customs and cultures. When mainland Southeast Asian societies embraced Theravada Buddhism, Rama began to be regarded as a Bodhisatta, or Buddha-to-be, in a former life. In this context, the early episodes of the story were emphasized, symbolising Rama’s Buddhist virtues of filial obedience and willing renunciation. Throughout the region, Hanuman enjoys a greatly expanded role; he becomes the king of the monkeys and the most popular character in the story, and is a reflection of all the freer aspects of life. 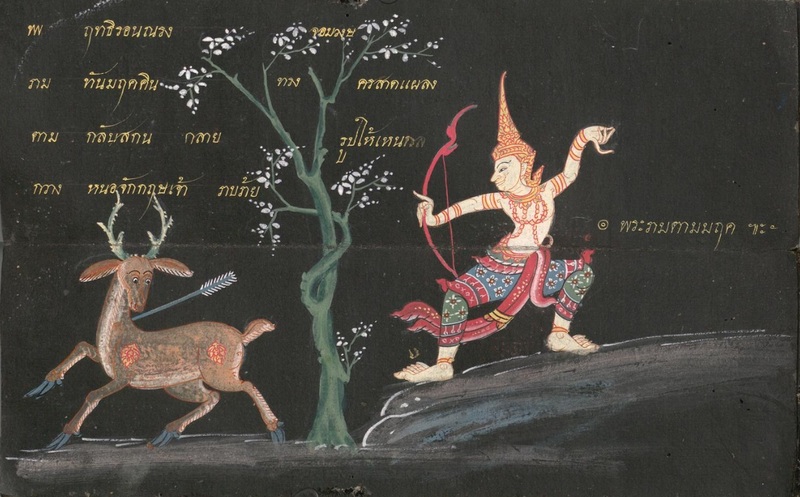 In a series of articles on the British Library’s Asian and African Studies blog, curators Annabel Gallop, San San May and Jana Igunma explore how the Ramayana epic has been rewritten and reimagined in the different parts of Southeast Asia. To read the articles, go directly to the Asian and African Studies blog. 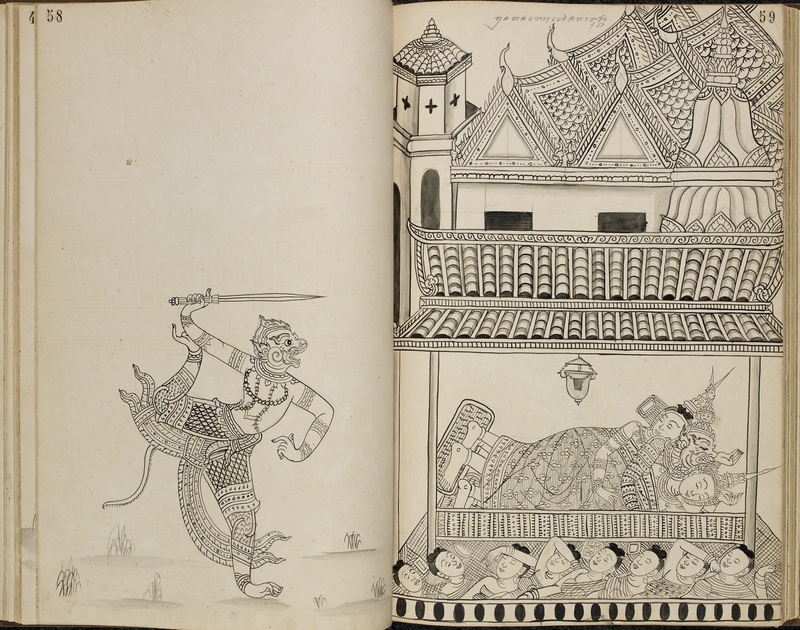 The Royal Asiatic Society London is pleased to announce that its small collection of Thai manuscripts is now searchable on its online catalogue. The subject of the texts is very varied, ranging from Thai law, history and literature, to Buddhism, herbal medicine, proverbs and fortune telling. All but one of the manuscripts is in the form of a folding book and most date from the 19th century. Some are unfortunately only single volumes from multi-volume texts. Several of the manuscripts were given to the Society in the 1940’s by H. G. Quaritch Wales, and the rest came from various donors. To see catalogue records for the manuscripts, go to http://ras.libertyasp.co.uk/library/Home.do and search for ‘Thai manuscripts’. Visitors are very welcome to view the manuscripts in the library. The Library page of the RAS web site at www.royalasiaticsociety.org has details of access arrangements. 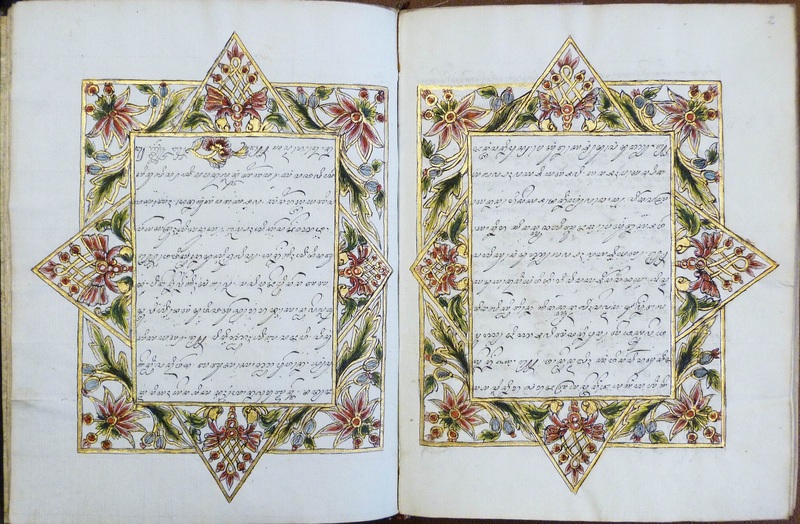 More details about the Thai manuscripts collection at the Royal Asiatic Society and many other interesting collection items and events can be found on the RAS Blog. The DART project is a collaboration between the University of Washington (UW) and research institutions in Thailand to provide online access to qualitative and quantitative social science research data on Thailand. Goals of the DART project are to: 1) develop best practices for digital archiving of multiple-format social science research materials and data, including rights and cultural property management; 2) develop a metadata schema and system design which allow for inter-operability of data for different uses; 3) surveying, aggregating, normalizing and cataloging data for inclusion a central registry at the UW. To this date, DART consists primarily of collections of ethnographic and anthropological materials collected by academics and researchers in Thailand in the 1960s through 1970s. Current DART collections are held in the following repositories: University of Washington Special Collections, Seattle, USA; and the Princess Maha Chakri Sirindhorn Anthropology Centre, Bangkok, Thailand. The project has started in 2006 by digitizing and indexing the archives of the Tribal Museum of Chiang Mai, where a huge number of documents, photographs and newspaper articles had been collected by the researchers of the former Tribal Research Institute between 1960 and 1990. The recovery of Thailand’s ethnic and cultural heritage is the main goal of this project. The digital archive has become an essential tool for research and teaching as they include resources for education, research and for visual anthropology. They also include resources useful to local communities and NGOs.